Bill H., a weekly Road Warrior, of Allpoints Corporate Express, Airport Sedans, regular passengers related the following story upon returning to Dallas Fort Worth International Airport on Delta Airlines from Salt Lake City. 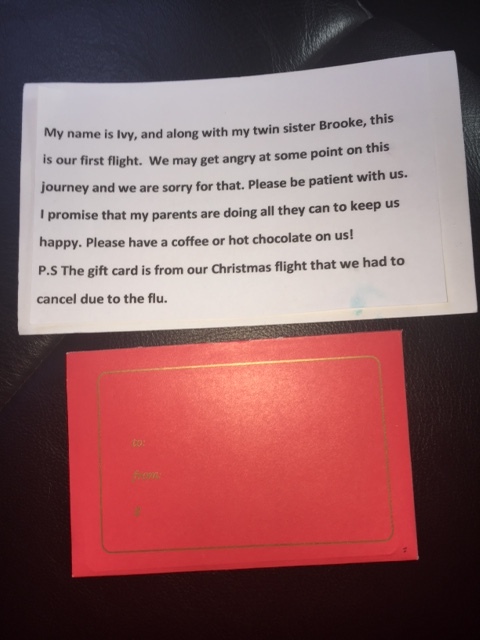 A gift card for Starbucks was included. Of course, Bill felt bad about his first reaction and told the parents that he would not hear them due to his noise canceling headphones. They told him to keep the card anyway. What a cool way to handle a situation!